Braniff Flight 352 departed Houston (HOU) at 16:11 for a flight to Dallas (DAL) and climbed to FL200. Some 25 minutes into the flight, the L-188A Electra was approaching an area of severe thunderstorm activity. The crew requested a descent to FL150 and a deviation to the west. ARTCC then advised the crew that other aircraft were deviating to the east. The Electra crew still thought it looked all right on the west and were cleared to descend to FL140 and deviate to the west. At 16:44 the flight was further cleared to descend to 5000 feet. At 16:47 the aircraft had apparently encountered an area of bad weather, including hail, and requested (and were cleared for) a 180deg turn. Subsequent to the initiation of a right turn, the aircraft was upset. During the upset, N9707C rolled to the right to a bank angle in excess of 90deg and pitched nose down to approximately 40 degrees. 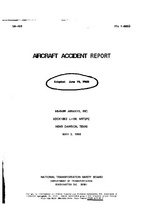 A roll recovery maneuver was initiated and the aircraft experienced forces of 4,35 g. Part of the right wing failed and the aircraft broke up at an altitude of 6750 feet and crashed in flames a little later. PROBABLE CAUSE: "The stressing of the aircraft structure beyond its ultimate strength during an attempted recovery from an unusual attitude induced by turbulence associated with a thunderstorm. The operation in the turbulence resulted from a decision to penetrate an area of known severe weather." The FAA issued an Airworthiness Directive, effective November 6, 1968, requiring all known US operators of Lockheed Model 188A and 188C airplanes to inspect the No. 1 wing plank at engine nacelles 2 and 3 for cracks, and to repair those cracks found as necessary. Following this accident large segments of the aviation industry started reviewing, amending, and updating safety and training programs and operational procedures regarding storm avoidance. Requiring all known U.S. operators of Lockheed Model 188A and 188C airplanes to inspect the No. 1 wing plank at engine nacelles 2 and 3 for cracks, and to repair those cracks found as necessary. Distance from Houston-William P. Hobby Airport, TX to Dallas-Love Field, TX as the crow flies is 384 km (240 miles).